Divine Strawberry Jam – so quick, so easy, oh so good! Strawberry Jam to die for! You’ll never buy strawberry jam again! My Mum would make jam all summer long. Coming home after school I’d open the front door to intoxicating clouds of sweet fruitiness and a hot sticky Mum. The glorious products of her day’s labour would be lined up on the bench, glistening like jewels. Sweetest strawberry brightly scarlet, intense crimson raspberry, deeply dark purple boysenberry – my favourite. And that was just the berries! There was the delicious sharpness of blackcurrant or the greenish tartness of gooseberry jams, glowing golden peach or almond studded apricot or pinky nectarine. Red currant jelly glowed like stained glass, or rarer still the pretty pink of crab-apple or Japonica jelly. Each glass jam jar, covered with it’s perfectly concave cellophane, secured with a rubber band and neatly labelled. Soon to join their companion bottled fruit in our floor to ceiling jam cupboard, a treasure trove of our garden’s summer abundance, to be revelled in through-out the long cold winter. Over the years I’ve never stopped making jam, it’s so quick and easy, even in small quantities, and it tastes infinitely better than even the most expensive of bought ones. I’m always amazed at how astonished people are when I say I make my own jam – clearly like saying I can fly to most people. But I can guarantee that making this recipe really is so easy and so quick – you’ll wonder why you never tried it before! You don’t need any special equipment and you can make it with just two punnets of strawberries. There are a couple of variations you can try too, Strawberry and Vanilla Jam and Strawberry Jam with Cointreau. Sounds good, right? By using a commercial pectin, you don’t have to boil the jam for long, keeping the colour and flavour fresh and bright. 3 tsp/15gm Jamsetta, a setting agent (pectin) in powder form. Wash jars and lids thoroughly & dry, place jars in a warm 150 °C oven to sterilise. Measure sugar and place in oven dish to warm up. Place a saucer in the freezer to chill. Rinse fruit, cut off leaves and cut into chunks, very small berries can be left whole. 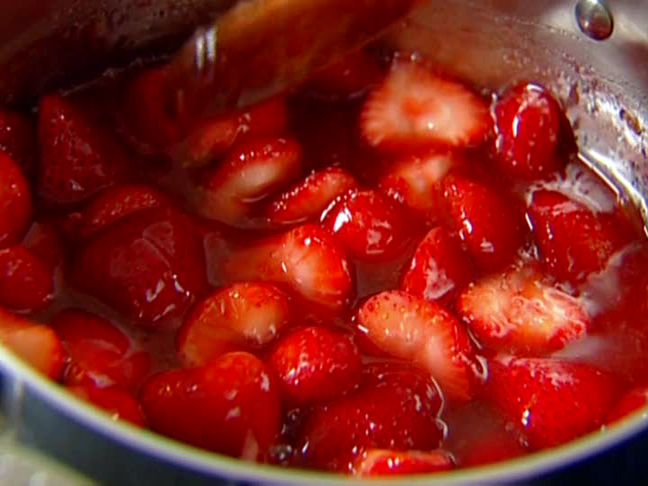 Place in a large saucepan, and mash up the berries a bit to release some juices. Bring to simmer on low and simmer 5-10 minutes until fruit is completely soft. Add the warmed sugar, lemon juice, the butter if using and the pectin, and bring to the boil slowly. Then boil for 5-10 minutes, stirring often. Be careful not to burn it on the bottom of the pan. Take off the heat and put about a dessertspoon on the saucer in the freezer and put back to chill for a minute. To test whether it’s set, push a finger through the jam, it’s set enough if it forms a wrinkled skin, and stays apart ( doesn’t run back together). If it’s ready, skim off any foam from the surface. Give the jam a stir to distribute the fruit evenly and pour into a heated jug. Fill hot jars and screw lids down firmly.Label. If it’s still too runny, and remember it will firm up more as it cools – put back on to boil & boil another 5 minutes. Repeat setting test. To make a larger quantity, just keep the proportions about the same – so for a kilo of berries, I would use about 800-850gm of sugar. If you can only get 250gm of strawberries, use about 190gm of sugar. Traditionally equal quantities of sugar to fruit were used, but I like to cut the sweetness a little. No need to wait – you can eat this jam straight away! But once opened, keep in the fridge in warm weather. To make Strawberry & Vanilla Jam, scrap the seeds from half a vanilla pod, drop in all in with the fruit, and follow recipe as above. Don’t forget to fish out the pod before putting the jam into jars. For Strawberry & Cointreau Jam, add ¼ cup of Cointreau and the finely grated rind of 1 small orange to the fruit once it’s come to a boil, follow rest of recipe. Where are they? Somewhere in the Pacific? was the general response. 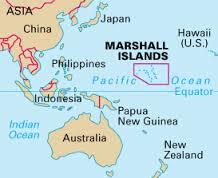 Yes indeed the Marshall Islands are located in the middle of the vast North Pacific Ocean, north of the equator, and due north ( a long way) of Vanuatu. They are everybody’s idea of the picture perfect tropical island. Very isolated, the group of 29 atolls and 5 lone islands is split into the Ratak Chain to the east, poetically called the Sunrise lands and Ralik Chain to the west meaning the Sunset islands . These are formed by two groups of a strung out straggling collection of long low coral atolls or some volcano tops barely rising out of the sea. 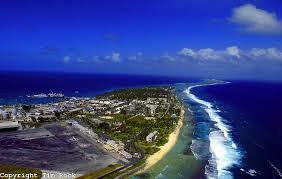 In fact since at their highest point the Marshall Islands are only 10 metres above sea-level!! they are in great danger of disappearing altogether. Much to the dismay of the local inhabitants facing rising sea levels. These islands are so small, they only just managed to squeeze an airstrip on one. There is no fresh water supply, islanders are still pretty much dependent on rain water. Native vegetation is limited to lush tropical island palms that can colonise islands, and wildlife to what ever flew there – so birds, bats, insects but of course fantastic marine life. Inhabited by sea-faring Melanesians navigating using ingenious stick charts over 2,000 years ago, the islands came to the attention of Europe with the Spanish laying first claim, then sold to Germany in 1884. They received their name from British explorer John Marshall (1788). During WW2 the islands were invaded by the Japanese after which the USA conquered them. Still mostly sustained by a big American presence, there is very little export or industry, some fishing, copra, some handicrafts and although tourism is increasing, it’s low because of it’s isolation .The world’s largest shark sanctuary was established there in 2011. But it’s an idyllic get away for those who like things laid back, and peaceful. Attractions revolve around the gorgeous ocean, diving, snorkelling, fishing or surfing and lolling around on pristine white beaches overhung by coconut palms is about it. 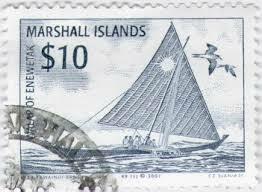 Marshall Islands are another on of those countries where I would venture to say that traditionally they don’t have a cuisine – they have food. And much of that nowadays is imported from the USA. Sadly this means a great deal of processed food is consumed, high in salt, sugar and fat. Tinned meat such as Spam is hugely popular as little meat was traditionally available. Like so many other Pacific Islands where soil quality is very poor, (see post on Kiribati) locally grown crops are scarce and mainly confined to a few starchy roots such as Sweet Potato, sago, cassava and tomatoes along with tropical island fruits like coconut, melons, and breadfruit. Here spicing and chillies are not common, recipes I found were very plain and simple, the natural goodness of the produce shines through. Since coconut is so vital in the Marshall Islands (not just for food) I paired it with fish, wrapped in banana leaves and topped with red onion and tomatoes. A side dish is sweet potatoes fried and tossed with brown sugar, red onions and some sambal – cos’ we like spicy food. 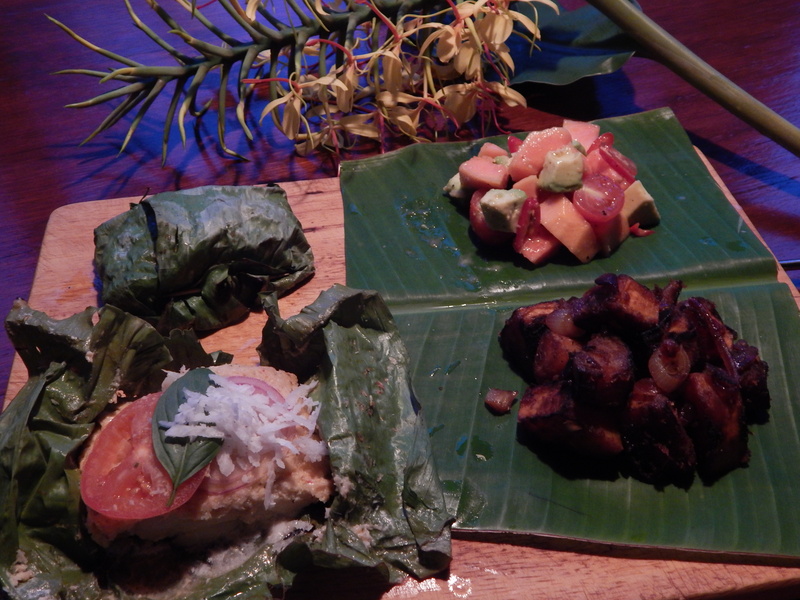 A simple salad of papaya seemed fairly authentic plus plain steamed rice, all served on banana leaves which gave us the tropical island spirit. Hubby loved the sweet potato which he normally won’t even eat – so a big win there! The fish parcels were delicious, I must confess to adding a bit of a fresh Malaysian style spice paste (or rempah) to jazz them up, but the combination of fish with fresh coconut was terrific. I loved it so much I gave it a 9/10, and hubby 8.5/10 a very high score from Mr Picky! I hope you will make this as it’s really yummy and the banana wrapping can be substituted with baking paper and foil if you need. I have wild bananas growing down the back of the garden so I can just pick some leaves anytime. Do try to get them if you can as they do impart a special fragrance to the parcels as well as looking exotic. To open a fresh coconut: DON’T PUT IT IN THE OVEN! I know a lot of recipes where this is advised – this is so unnecessary and will only ruin the beautiful flavour of your fresh coconut. It’s really simple, first pierce the eyes with a sharp knife point, let the coconut water drain through a sieve into a bowl. (i) Cup the coconut in the palm of one hand, with the eyes at the top of your hand. With the back of a heavy chefs knife or a cleaver firmly hit the middle of the coconut. Go around the circumference of the coconut, hitting firmly. You will hear the shell cracking as you go – once it’s 3/4 done, just pull the rest apart. There you have it – so easy! (ii) Use a small thick blade to prise the flesh out, it comes out quite easily in large chunks. Peel the brown skin off with a potato peeler, then rinse the coconut flesh and it’s now ready to use. 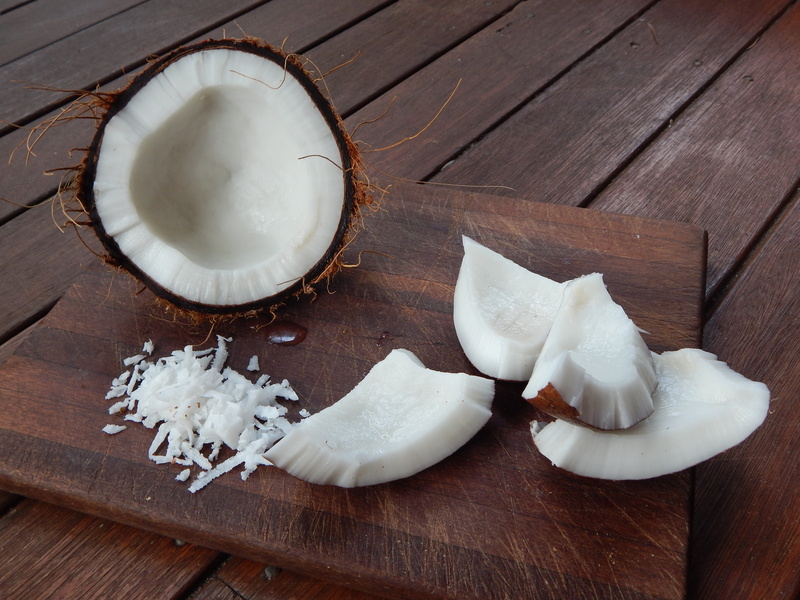 To make fresh coconut cream and milk: (i) Grate the chunks of fresh coconut in a food processor. Reserve 1/3 for Rempah. Place grated coconut in a blender with 1 cup of near boiling water. Blend on high until smooth. Let sit for 10 minutes. (ii) Pour into a wide jug or bowl lined with a clean damp tea towel or cheesecloth. Tightly wring out the cloth, extracting as much liquid as possible. Put coconut back into blender and repeat process with another cup of water. (iii) Leave the extract to sit 15 minutes, The thick cream will rise to the top, carefully spoon this off. What’s left is your delicious fresh coconut milk! OMG so much better than even the best of the tinned stuff. (iv) The coconut solids can still be used, in place of desiccated coconut in cakes and desserts, or in curries etc. Can be toasted golden for a lovely topping to sprinkle on pancakes, cereal or yogurt. To make Rempah, blend chilli, lemongrass, chopped red onion, reserved grated coconut, salt and pepper together into a smooth paste with a little coconut milk to help blend. Cut banana leaves into 4 large squares, cutting either side of centre rib. Wash and carefully dip into boiling water to soften. Dry. Oil the centre of each leaf, place fish fillet on top, then top with spice paste. Lay slices of red onion along fillet and top with sliced tomato. Spoon 1-2 TB of fresh coconut cream over fish. Fold leaf over to form a parcel, fold ends over, secure with toothpicks. Either grill, BBQ or place on metal rack and cook base of parcels over a gas flame ( to get charred flavour) Turn carefully to cook other side on grill or finish cooking in oven if cooking over flame. 5-10 minutes depending on thickness of fillet. To serve, place each one on dinner plate and let diner open own parcel- ah the aroma! Will take you to the South Seas! Overall Marshall Islands scored well, an average 8½ /10, (7/10 from the kids, as they’re not so keen on fish). Cut potato into finger thick slices (about 1.5cm) Heat oil in large frypan on medium heat, fry potato on both sides until golden brown. Add onion and fry till softened. Add chilli, sugar and soy sauce, toss well. Fry, adding a little water if necessary 3-5 minutes on low, until potato is tender. Peel, seed and cube papaya and avocado. Cut tomatoes in half and thinly slice chilli. Put in a small bowl, season with salt & pepper, squeeze over lime juice and toss lightly. Bhutan – some like it hot hot hot! I’ve always dreamed of going to Bhutan, one of the most unspoilt and picturesque countries in the world -alas the cost is so prohibitively high, only the well heeled can afford it. Sadly I know I’ll never make it there. But I have been to Myanmar, which (in 1990) was also one of the most difficult countries to travel to. And that was very special, but still not as entrancing as Bhutan…….. 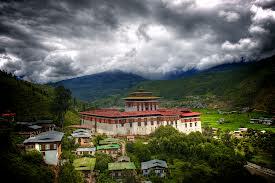 The Kingdom of Bhutan has been known as Southland of the Herbs, the Sandalwood Country and the Land of Happiness. A high altitude land-locked country sandwiched between Tibet to the North and Northern Indian states to the West And South. 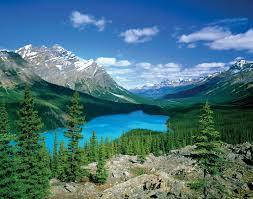 It’s a land of towering high peaks, fast flowing rivers and deep valleys. Sub-tropical jungle in the south, it becomes Polar and snow-bound in the north, this allows it’s outstanding range of biodiversity. There are five seasons, spring,summer,autumn, winter and monsoon. Tradition is very strong in a country which was almost completely isolated from the modern world until the 1960’s and only allowed TV and the Internet in 1999! So it’s rich and unique culture has remained intact, the government decried that all citizens must wear traditional clothing when in public! Thanks to the hefty mandatory charge of US$250+ per day per tourist, tourism will be limited and it will probably remain so unspoilt. 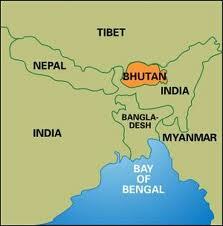 Religion is intrinsic to Bhutanese life, predominantly Buddhist with Hinduism practiced in the south. Some of the most spectacular sights are the precariously situated Dzongs (fortress) such as Punakha and Trongsa and the Taktshang Goemba (monastery) and other historic buildings in the capital Thimpu. Check out fantastic wildlife, go on cycling tours, mountain treks, snow treks, fly fishing or admire spectacular alpine scenery. Heavily influenced by the proximity of Chinese culinary traditions and Indian cuisines, Bhutan has come to love the chilli as no other – so much so that they eat it as a vegetable not just a condiment! The national; and ubiquitous dish is a chilli and cheese dip served with everything, rather like a sambal or pickle, called Ema Datsi. Dairy mostly cheese and butter is a very important source of protein, from cows, yaks goats and buffalo. Buckwheat and red rice are the main grains along with barley and millet, all cool climate crops, and used to make breads, noodles, dumplings and biriyani style dishes. 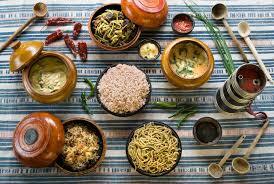 Remembering many Bhutanese are vegetarian, beef and pork are commonly eaten and trout from their pristine rivers. Much is made of wild gathered food such as ferns, canes orchids, wild greens like radish and turnip tops, wild berries and especially adored are mushrooms such as Chanterelles. Many fresh herbs like coriander, dill and fennel are used along with ginger,garlic and shallots. Of course lots of ‘Indian’ spices are used with Szechwan pepper, Perilla and poppy seeds particularly popular. The food of Bhutan is often blisteringly hot, but as richly varied as this jewel of a country is itself. 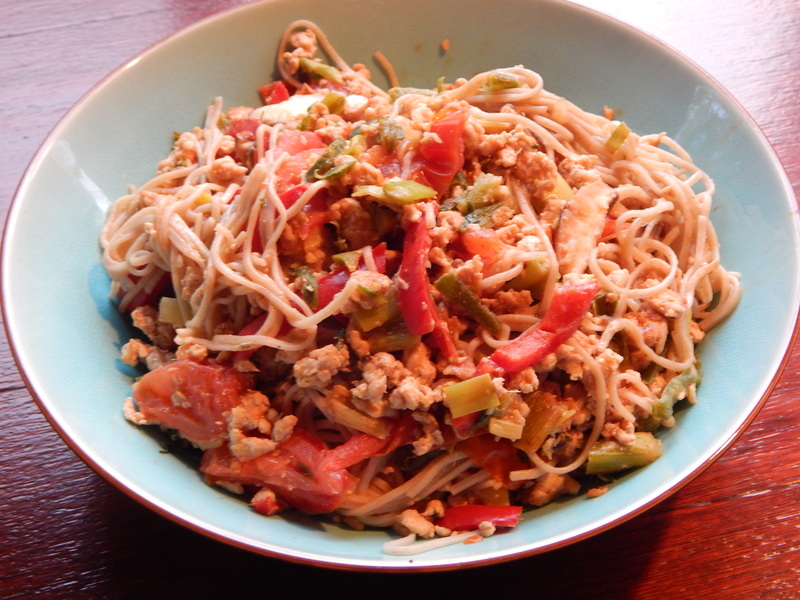 This recipe was taken from http://www.asian-recipe.com/bhutan/bh-vegetarian-recipes.html with some slight changes on my part – namely I made a mistake with reading the recipe, and I love Szechwan pepper! I think the combination of buckwheat with poppy seeds and boy choy is so interesting. To make the filling, cook the bok choy in a saucepan of boiling water for 5 minutes. Drain and squeeze dry. Grind the poppy seeds and peppercorns with a spice grinder, or in a mortar. Process the onion, garlic and ginger until finely chopped. Add half the melted butter and the rest of ingredients and pulse briefly until just combined. Leave to cool. To make the dough, combine the flours in a food processor. With the motor running pour the water and the rest of the melted butter through the feed tube and process until the dough forms a ball. Dust the ball with flour. Cut the dough into 8 pieces, dust with flour, and cover with plastic wrap to prevent drying out. Roll out the remaining piece with a pasta machine according to the manufacturer’s instructions, down to the second lowest setting, dusting with flour occasionally to prevent sticking. Or rollout thinly with a rolling pin. Place the dough sheet between sheets of plastic wrap. Roll out the remaining dough in the same manner. Cut the sheets, 1 at a time, into 4 by 2 inch [10 by 5cm] rectangles. Place 1 teaspoon of the filling in the center of each rectangle. Brush the edges lightly with water and fold the rectangles over to make squares, pressing the edges to seal them well. Cook the dumplings in batches in a saucepan of simmering salted water until they float to the top and are tender. Transfer to paper towels to drain. Serve with Ema Datsi or if you’re pressed for time as I was – Chiu Chow Chilli Oil and garnish with fresh chilli and chopped coriander. I made this dish with chicken mince not the more traditional pieces, as that was all I had on the night. The flavourings are very Chinese but with a twist, for the buckwheat noodles I used Japanese Soba noodles which are probably more refined than the more homey Bhutanese version. Rinse 2/3 packet of noodles under cold running water, bring large pan of water to the boil. Add noodles and boil for 2 minutes, drain. Cut the chicken into cubes, season with 1/2 tsp salt and plenty of freshly ground black pepper and toss with cornflour making sure all pieces are totally coated. If using mince, sprinkle flour over. Heat oils over medium heat in a non-stick wok or skillet. Cook chicken until pieces are browned on both sides and slightly crispy. Remove with a slotted spoon and set aside. Heat other 1 tsp of sesame oil, add sliced onion, minced garlic and ginger and stir-fry for 2 minutes. Add capsicum, chillies and shallots, cook another 2 minutes. Return chicken to pan, add sliced tomato wedges, season with soy sauce and heat through another minute. Add the noodles to the pan and toss everything together. Serve garnished with chopped coriander. My family enjoyed this meal, although making the dumplings was a lot of work, especially on a hot night – better suited for a cold winter night. Hubby isn’t fussed on buckwheat noodles and was fairly unimpressed, but Bunny and I loved these unusually spiced dumplings – I could have eaten a lot more of them for sure! Our Bhutan meal got a combined score of 27/40, the dumplings getting thumbs up from all but hubby.